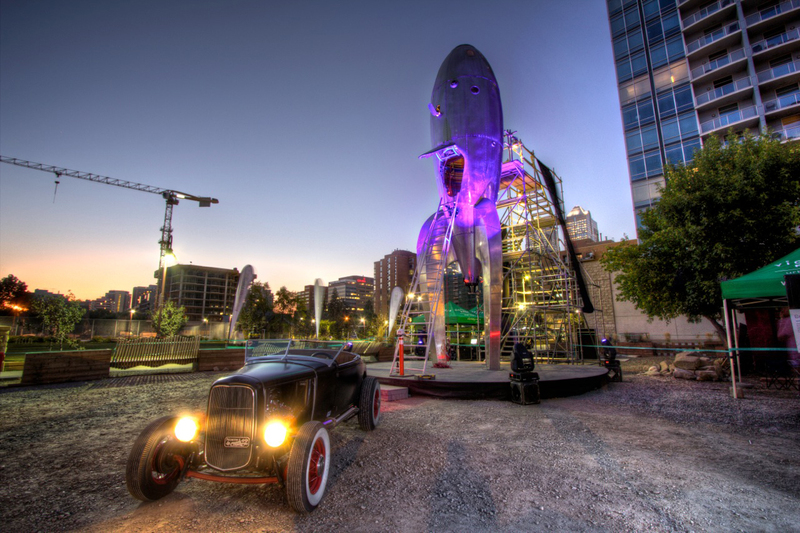 Five Ton Crane had a fantastic time showing off the Rocketship in Calgary last week at Beakerhead. Look out Canada… Five Ton Crane is heading North! 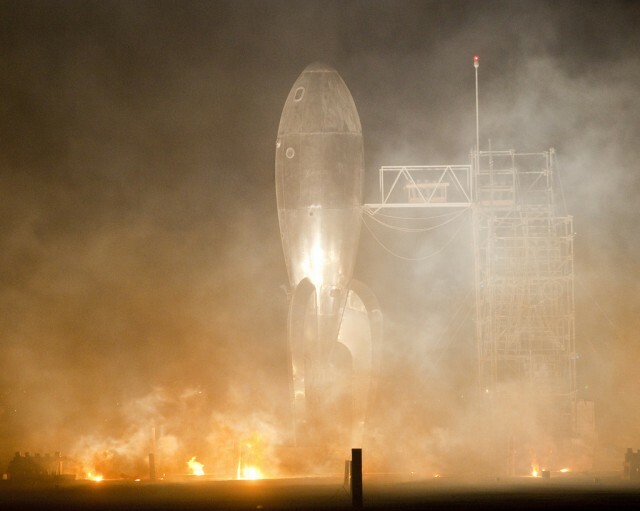 Here’s a recent article about the Rocketship in the SF Chronicle by honorary Space Cadet John King. 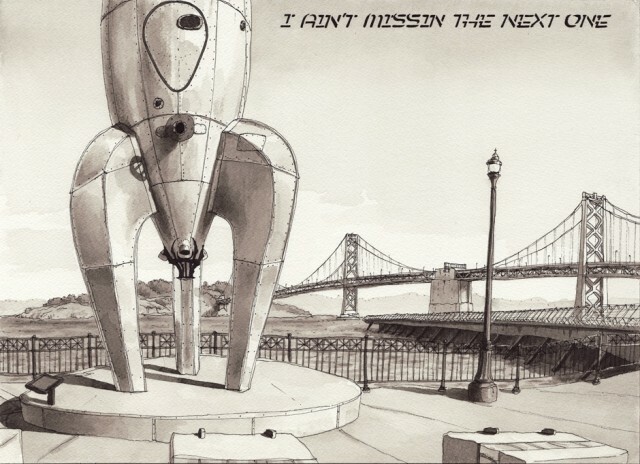 Thanks John… we just heard back today that the Port Commission agreed to extend the Rocketship installation at Pier 14 in SF for another year… until October 2012! “There is no social message in this artwork of oversize whimsy. It says nothing about local history or culture. The aluminum skin is a surprise amid the Embarcadero’s masonry buildings. It is what it is: a curvilicious gleam that captures the gee-whiz air of futurism past, on loan from the Black Rock Arts Foundation. The Port Commission will vote Tuesday on whether to let Raygun Gothic stay until October 2012, and how can anyone say no? This is art that sparks imagination and joy, the stuff of which vibrant cities are made. The Rocketship featured on the cover of the SF Chronicle’s Datebook section. 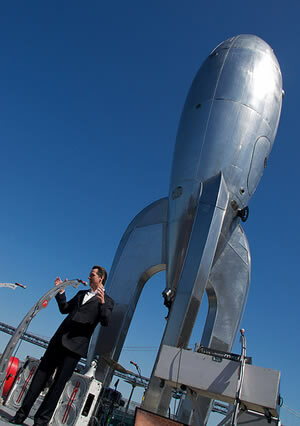 The “Raygun Gothic Rocketship,” a retro-themed sculpture, was installed at Pier 14 in San Francisco in August. The odd extremes of 2010 come down to this: Within 24 hours, the San Francisco Giants won the World Series, and the flat-earth movement captured Washington, D.C.
And when we narrow our focus to Bay Area architects, I’d be hard-pressed to name the 10 best buildings of the year – or even 10 major structures that got built. On the bright side? The year saw neighborhood-scaled planning that teases us with the promise of sustainable, transit-friendly urbanity. Long-overdue infrastructure projects finally started construction, such as the fourth bore of the Caldecott Tunnel and the reinvention of Doyle Drive. Bootstrap urbanity: My name for the ingenious efforts by architects and public space advocates to carve eddies in the urban swirl – from the “parklets” concept that is replacing parking spaces with bits of seating to more ambitious efforts where awkward intersections are being converted to “temporary” landscaped plazas. Aesthetically, some work better than others, but San Francisco’s lucky to have such experimentation in its midst. San Francisco transit shelters: Naysayers carp that on rainy, windy days, these shelters are no shelters at all, because they include wide openings on the back to allow easy access for people in wheelchairs. With 100 shelters now sprinkled across the landscape, in seven site-specific permutations by Lundberg Design, what I see is a rippling treat, roofs of red and orange that add grace to our urban terrain. One Hawthorne: When (if?) construction cranes again appear on the downtown horizon, let’s hope they spawn new towers as neighborly as this 24-story residential high-rise designed by EHDD Architecture. It’s a too-snug fit for the site, but the clean modernity is right at home near Yerba Buena Gardens. H2 Hotel: At a time when so much infill development is tawdry skin-deep mockitecture, this five-story inn near Healdsburg’s central plaza shows how to do it right. David Baker + Partners crafted a building at once contemporary and contextual, so keyed to its location that on warm Wine Country days, the ground-floor walls fold up and disappear. Potrero Branch Library: San Francisco’s Bureau of Architecture worked wonders with a mid-block library on Potrero Hill from 1951, turning the dilapidated structure into a glassy beacon of literacy – including panoramic walls at the rear that showcase the city beyond. Bureaucracy at its best. “Raygun Gothic Rocketship”: My plebian idea of triumphant public art is something engaging and brash, a charmed surprise up close and from afar. Bonus points for the local angle: This 40-foot-tall stainless steel whim will be on display along the Embarcadero through next fall, thanks to the Black Rock Arts Foundation of Burning Man fame. Oakland Museum of California: Kevin Roche’s understated collage of right-angled concrete was brought into the 21st century by Mark Cavagnero Associates. The changes exude a disciplined order, such as a crisp new canopy at the Oak Street entrance, but they also make space for Job One: the enticing display of art. Sacred Heart Cathedral Preparatory: The year’s most ingenious building addition can’t be seen from the street; instead, a high school at the base of immense St. Mary’s Cathedral filled a courtyard with a concrete-walled theater, its scalloped form taking cues from the icon that Herb Caen often likened to a washing machine. Case + Abst Architects. Gallery House: I tend to ignore private homes, but this three-story insert is on the uber-public South Park. It’s also a tutorial by Ogrydziak/Prillinger Architects in experimental design with opaque glass along the street and two black voids above, screened by a web-like abstraction of weathered steel rods. A focused provocation that earns your double-take. Robert I. Schroder Overcrossing: In today’s “crabbed and fearful” America – thank you, Jon Carroll – any government expenditure beyond pothole repairs is scorned as a debt-inducting frill. But with this metallic footbridge that leaps across Treat Boulevard near the Pleasant Hill BART Station, engineer Arup and architect Donald Macdonald show that our society can still create public works of lasting merit, worthy of pride, if only we try. Mercury News photojournalists make images every day of the year. The images don’t always come from a breaking news or sporting event – they may be portraits of interesting people, “moments” that connect with the reader, or simply something out of the ordinary. In 2010, our photojournalists captured thousands of images: These are among their favorites. San Francisco, CA—Mayor Gavin Newsom today joined the Black Rock Arts Foundation (BRAF) and the Port of San Francisco to celebrate the unveiling of Raygun Gothic Rocketship, a 40-foot-tall sculpture created by a team of Bay Area artists lead by Sean Orlando, Nathaniel Taylor, and David Shulman. 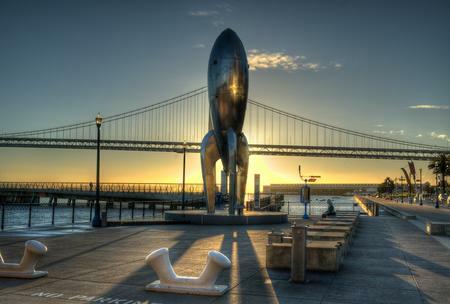 The Rocketship, poised as if to board passengers for a typical run to a nearby stellar destination, will remain at the Pier 14 Tidal Plaza, at the base of Mission Street, on the Embarcadero for a 14-month temporary exhibition. The 40-foot-tall artwork offers a retro-futuristic, highly-stylized vision of space travel circa 1930’s-1940’s science fiction and is the latest in a series of temporary public art exhibitions sponsored by BRAF to enliven and activate public spaces. The sculpture will be accompanied by a companion piece, the Rocket Stop designed by Alan Rorie, which tells the story of the Rocketship’s exploits, providing route, schedule and other information. The installation will be illuminated for nighttime viewing. A nice write-up of the installation, with some great day-time photos. You can get a nice write up and some good photos of the ship HERE.